JARD AR Curved Bottom-Adjust Single Stage — Jard, Inc.
JARD AR Curved Bottom-Adjustable Single Stage triggers feature adjustable sear engagement from the underside of the trigger system. Offered in a small pin or large pin formats with either speed or weighted hammer. The JARD AR Curved Bottom-Adjustable Single Stage trigger is offered with a small pin, large pin, or weighted hammer. 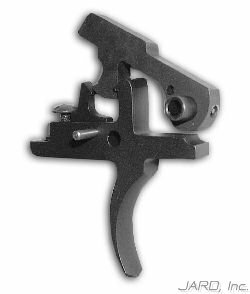 The JARD AR-15 Bottom Adjustable Trigger System allows you fine tune your trigger pull from the bottom of the trigger. Spring kits available below which can be used to change pull weight. Uses factory hammer pin and trigger pin (neither are included with this kit). Some Colt rifles use an approximately .170" (large) hole for the hammer and trigger pins as opposed to the .154" (small) diameter pins all other brands use. This change was made in order to make it more difficult for civilians to use M16 parts in AR rifles. This is important to note, and before purchasing any hammer, trigger, disconnector or lower parts kit you need to check the diameter of the holes in your lower to determine if you have a "large" or "small" pin lower receiver.